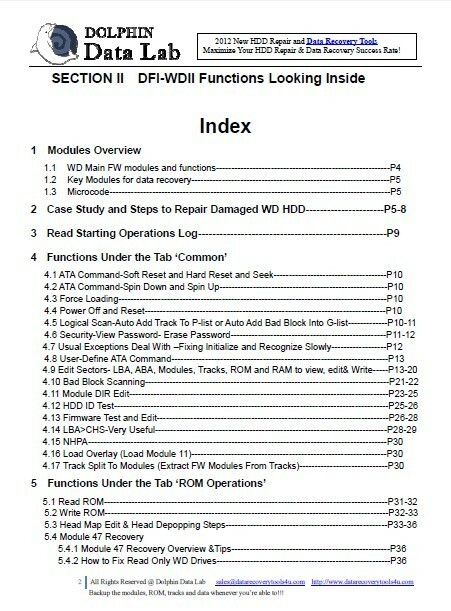 Dolphin Data Lab has finished the improved and advanced hdd repair and data recovery guide for DFL-WDII hdd repair tool. 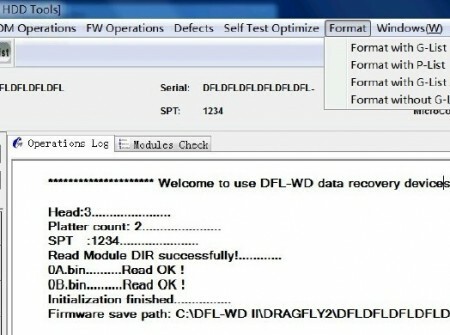 DFL-WDII is one very powerful and professional western digital hard drive firmware repair tool, with the unique hdd repair functions offered with DFL-WDII, users can fix many more WD hdd repair cases than with any other wd hdd repair tools and now we are offering this advanced new WD hdd repair guide to our users for free who bought from Dolphin Data Lab. 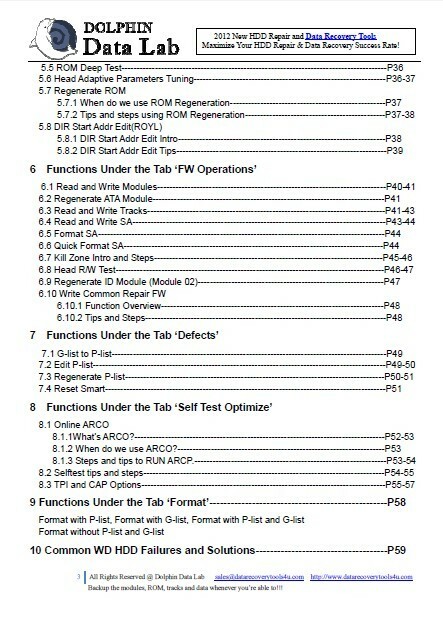 We keep adding new hdd repair tips and information to this guide and clients can get them for free too with us. 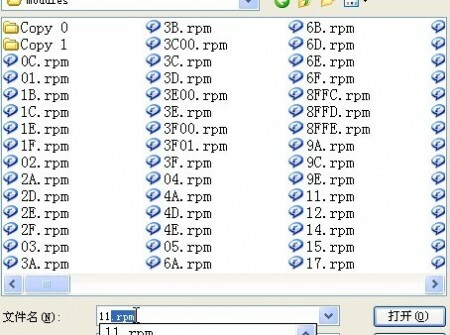 As you can read from the index of the DFL-WDII hdd repair guide, you learn not only how to use DFL-WDII hdd repair tool, you learn about the main FW modules of WD HDD including the modules functions, tips of using the modules and common WD hdd repair failures and solutions to repair it. 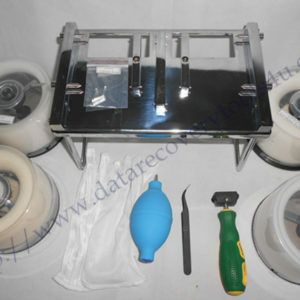 Anyway, good hdd repair tools and hdd repair guide don’t mean you can repair all hdd and recover the lost data immediately and you need to have enough practice in hdd repair and data recovery and you also need to study further different hdd failures and share data recovery tips with other hdd repair and data recovery engineers. 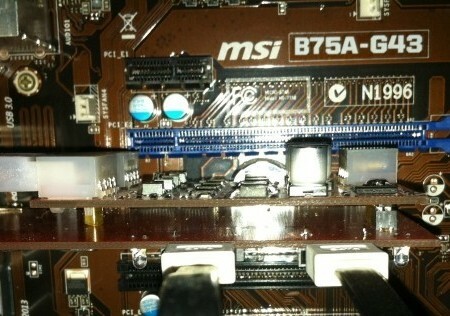 This is actually the fastest way for you to have something done really good in this field. 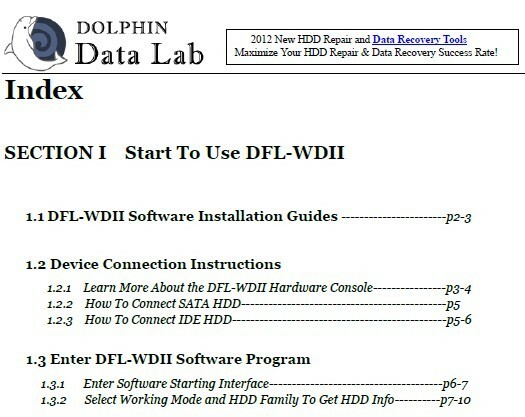 Dolphin Data Lab has all rights reserved for the hdd repair guides and clients must use the information offered inside for themselves only and never disclose those information to a unauthorized third party and if this happens, we will refuse to give out any further information and guides to whoever leaking the information, no upgrade, no support and even block the tool to be used again. 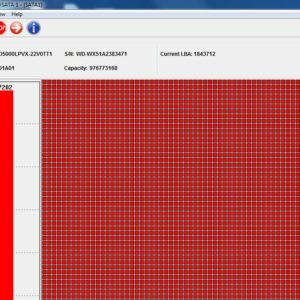 Users can learn more about our data recovery tool or hdd repair tool here. 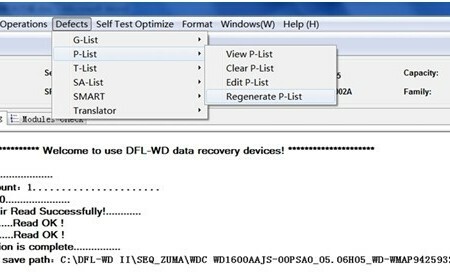 All DFL-WDII users are able to get this new hdd repair guide for free but one email to ask for it is required to send to sales@dolphindatalab.com.